Back in June I talked about the three basic Historical Driver strategies for Championship Formula Racing: Front A, Even, and Back S. A couple weeks ago we discussed variations on the Front strategy. This time out, lets compare the three Even-ish Strategies and see how they riff on the theme of spending resources evenly. My intent with the Mathy strategy was to have a car that took advantage of starred moves as much as possible. The idea behind the Stalking strategy was to stay within striking distance for a move a little later in the race. Same note as last time that these are not exactly the same as the versions of these strategies published in the game. Reasons and links at the bottom of the article. Now lets look at each Phase by Phase. Same analysis process as last time... basically I'm measuring how much faster this strategy wants to go than a safe 0-wear plot. More words at the bottom. Starred vs. non-starred is going to be a real theme for this group of strategies. You can see here that only Stalking is willing to spend some wear into the first corner unless it is an efficient play. All three of these strategies include conditionals if they have more wear than c. So lets look at both parts of that equation separately. For most races and drivers their wear will be lower than c initially but if no wear gets spent in the first couple of corners that can change on shorter tracks. So mostly, none of these strategies want to spend much in this phase... But Even will spend if it has w >= c; Stalking will spend more than Even if the move is starred or they have w >= c; and Mathy will spend more than either if its a starred move. After last phase's variables, Phase 3 sees the Mathy and Stalking strategies revert to being mostly concerned with stars. Even picks this middle phase of the race to be consistently prepared to spend some wear. As usual, phase 4 has a lot of conditionals and cars will generally spend based on how much wear they have left at this point. But one thing to note is that all three strategies can transition to this phase differently. Mathy can get pushed here if they did not spend much wear earlier in the race and eventually gain w >= 2c. Phase 4 for Mathy is much more willing to spend wear without there being a star than it's previous phases. Even will only move to this phase if the car has entered the last 3rd of the race -- which is unusual. And phase 4 for Even is very clearly defined by the wear remaining on the car -- have little wear: spend 1; have lots spend 2; in between spend 1 or 2. Stalking has a more common transition to Phase 4 that includes moving here if w <= laps *2. Which is really just a way to get them to Phase 5 quicker because Phase 4 for Stalking is actually its fastest phase. I had to provide two numbers for each phase for these strategies because so much changes with stars. Mathy basically only spends wear if there is a star for the whole race. Even doesn't actually care much about stars and spends more middle and late than early. Although that can vary if Even has a lot of wear left early in the race. Stalking does care about stars but also defaults to spending wear late if it has it. Next up I'll discuss the variations on the Back strategies. Remember, links to the above 3 strategies below. What is the Analysis Here? The main way to measure a phase's intent is to look at the first starred and non-stared symbols in each tactic. This gives you a sense of how much faster the car will likely try to go. Think about it this way -- a car that wants to spend 1 wear in the upcoming corner will try to go 20 mph faster than a car that does not want to spend any wear, all other factors being equal. 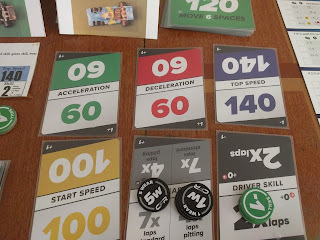 If you then multiply each of those possible results by the odds of them being first choice, I get a net result of how much faster this car wants to go. It might not be able to go that fast, but that's on the driver not the strategy. I'm going to call this "net" in tables below. Note that anything with 3 circles of any kind, should be considered starred because that is how the tracks are designed. Also note, that if a tactic does not lead with a starred option, I'll count the first un-starred option for that tactics starred value since its more likely to be used. How Are the Strategies Different? Three minor editorial choices I've made since publication: 1) HDs can push start using only 1 green skill (the start speed test table changed a bit right before publication...); 2) I decided that the red skill chip could be used more places in relation to HD die rolls; 3) there were a few tactics that had 6 symbols on them and my BYO tool only allows for 5... Links to these version in my BYO tool are at the end of this article. My 10 car field of historical drivers and I took the short ride over from Belgium to England in preparation for race 7 out of 10 in my 2017 solo championship. I'm excited to be leading the series if only by a point after I drove through the carnage at Francorchamps for my 2nd win. My plan at Silverstone is to ignore the desire for a high top speed. I want to bid low, start fast with my 100 start speed, then use my 60-60 car to save some wear for when I really need it. I'm hoping that the 140 top speed doesn't bit me. I will be wrong. Below are the results after the pole bid. Fangio and Vettl bid the most again. Fangio got pole after a tie-breaker roll. Kimi Räikkönen is actually inside of me in the 4th row -- much higher than he normally starts. Stewart's orange car sits outside row 2. The First turn was important to me. I wanted to pass some people here. 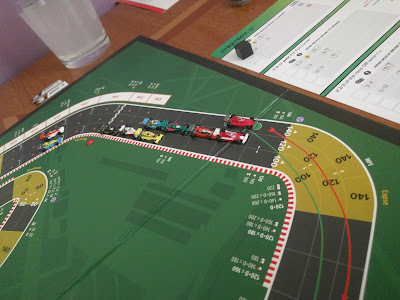 Below you can see that I did pass Hunt (white car) and Mansell (black car) but Alonso did his usual and ended up inside me. 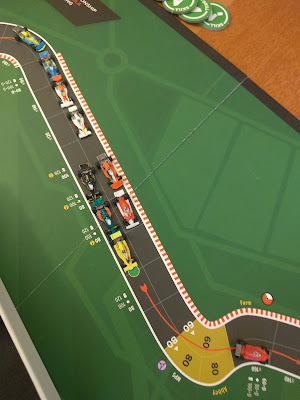 Partly that's because I chose to end up behind Rindt for a possible slip next turn. 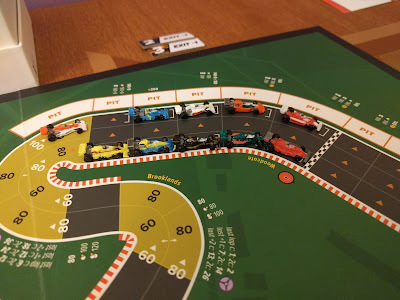 So, I only gain 1 spot on turn 1. A couple sectors later and we are half-way through lap 1 and I've fallen back two more spots. First Hunt dove inside me while I was on the line in front of Becketts. Hunt spends more wear than I to stay inside through the corner then uses his better top speed to pull ahead. Then at the end of the Hanger straight, Mansell spends more wear in the corner and ends up inside me after I got the slip to stay even. Not much changes as lap 1 turns into lap 2. Vettel leads in the white-trimmed Ferrari but he had only 2 wear left at the half-way mark. Fangio sits second and looks good with 8 wear. Stewart has 4 wear in 3rd but broke his top speed trying to go 180 through Copse the turn before the image above. Rindt has 3 wear in 4th. Alonso sits in 5th -- half-way between the lead pacl and the rest of us -- with 7 wear. Mansell leads the rest of us and has 12 wear left. Hunt has 7. I have 11. Fittipaldi has 5 wear. Raikkonan is way back there but has 14 left still. This is the crucial turn. We start with the groups pretty much as they were above to start lap 2. Alonso has fallen back to the pack. Raikkonan went 200 last turn to close up some. In the picture above, note a couple crucial details: 1) Fangio is right behind Vettel, 2) I'm no in a slip position. In the picture below, there were two big things happening. Most importantly for the race, this is where Fangio makes his move. He pushes his top with dice, makes it, spends 2 wear in the corner, and passes Vettel cleanly. As we'll see later, this is the end of the race. Most importantly for me, I went from 3 spaces behind Alonso to 5. Alonso pushes to 180, Mansell got two slips, Hunt also pushed to 180, I only went my 140 top. Thankfully, Fittipaldi broke his top speed trying to pass me or this would have been even worse. Below we have two forced passes. First (on the left), Alonso goes 180 and squeezes past Rindt into 2nd. Two turns later (on the right), I pass Stewart into 6th. Raikkonen broke his brakes trying to slow for Abbey and is the first retirement on the day. The next turn is below. Fangio waves to his pit crew. Alonso enters Luffield, but not quickly. Vettel takes a chance and crashes. A turn later, Mansell is next to Alonso having run through Luffield faster. Rindt it right on his tail and I'm behind Rindt. The end result of this is that Mansell was able to pass Alonso for a second place. Rindt was also able to get slips to pull into 3rd. Alonso ended up 4th and I was unable to improve on 5th. I built another Google Photo Album for this race. Every turn is recorded there. I made some notes as well. My advice is to click on the first image, click on the circled i symbol to reveal my notes, then page through that way. I stayed ahead of Stewart in the season rankings who finished 6th. And a big win for Fangio -- his 3rd this year -- to put him right back in the conversation for the title with 3 races left. A disappointing result for Vettel who retired from his second race in a row to really fall behind the 3 season leaders. 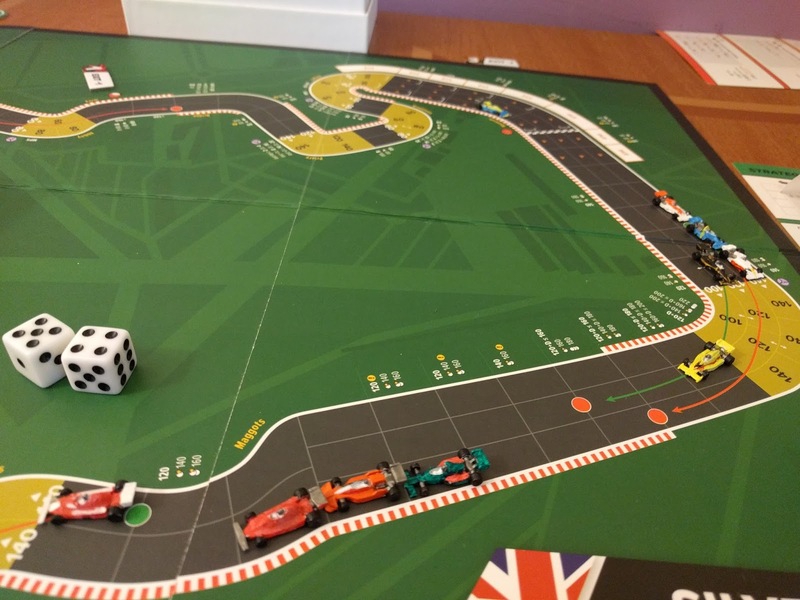 Also disappointing for Alonso who dropped from 2nd to 4th across the finish line. On the other hand, this was the best results on the season for both Nigel Mansell and Jochen Rindt who finished 2nd and 3rd. Raikkonen's first DNF of the season means that there are now only 3 drivers who have finished every race: Me, Stewart, and (ironically) James Hunt. 2018 Organized Play Season Will Be Huge! 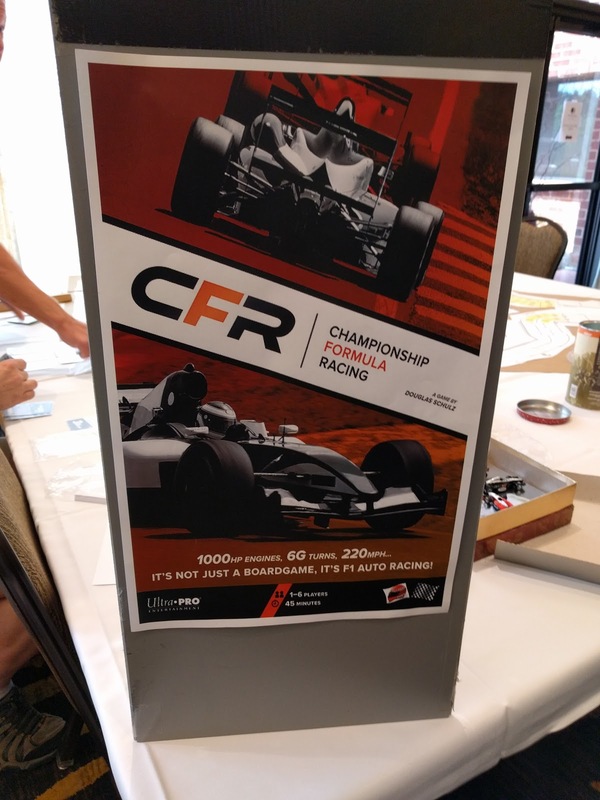 Well, it certainly shapes up that the second season of Championship Formula Racing will be bigger than the first. 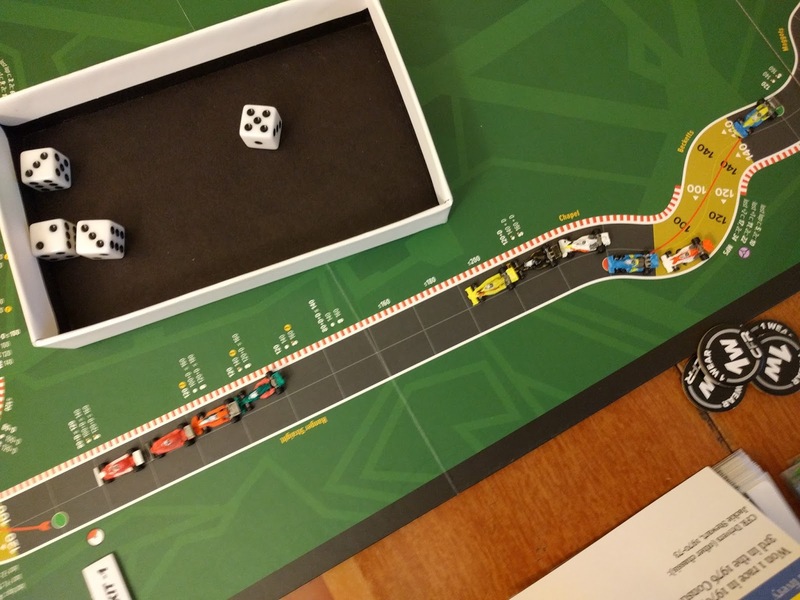 I've updated the calendar and there are already 4 in-person seasons or tournaments planned plus 3 more single race live events and the 2 Play-by-email seasons that are already underway but will count towards the 2018 season as they are still in progress. 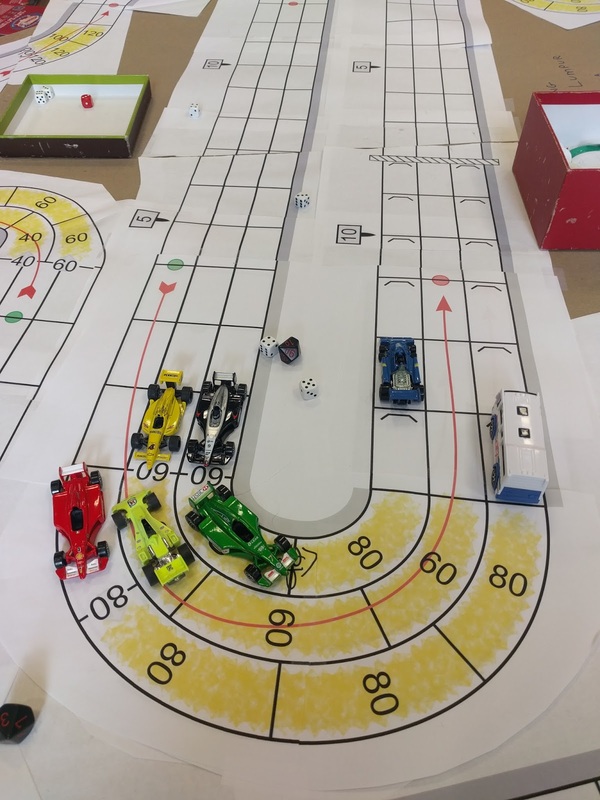 The first race of the 2018 season will be held August 26th starting at 10:30 am at the Congress of Gamers in Tysons Corner, VA. If you've been to the event in Rockville by the same name, expect the same event in a different setting. Sadly, I will not be able to make that race but Michael Polcen will ably steward. For more information about the Congress of Gamers see their web page. Also note that I plan to run races at the Congress of Gamers in Rockville to be held October 7-8 and the related Winter Games Fest in January. The big newcomers to this calendar are the biggest seasons planned for 2018 -- one in Detroit and one in San Marino. The Detroit series will feature 8 races and starts September 8th. This is a great group of veteran drivers that are more than happy to bring in new-comers. Check out their web site for more details. The San Marino season is planned for 9 races starting September 26th. This will be the first CFR event to take place in Europe. Given the large number of Italian fans of CFR, the interest from San Marino makes sense. 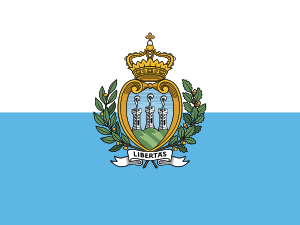 Check out the web site for the San Marino gaming association that is running the season for more information... if you can read Italian. Tournaments for PrezCon and WBC are planned as usual. There are two email based seasons going on right now. Mine and the Redscape series. Both run 3-race seasons with multiple races to accommodate all of the participants. Both use a ladder system to advance drivers between the heats. For more information about my series, see that page on my site. For more information about the Redscape series, email me and I will pass you on to Mr. Polcen. Long time driver, Robert Rund is also thinking about putting together a email race using the pitting rules. If you are interested, email him. 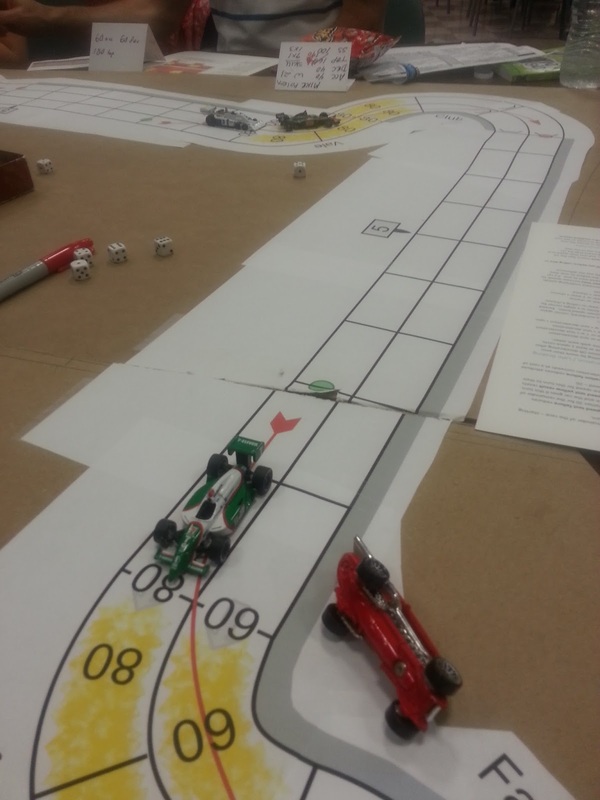 The inaugural Championship Formula Racing Organized Play season has concluded. Before we get to the awards, some data on the season. It is hard to compare these numbers to past recordings since those would be pre-OP numbers but these numbers are all larger than I have seen in the last 5 years that I've been meaningfully ranking drivers. Last year I tracked 31 races and ranked 89 drivers for a total of 316 Driver Races. In 2013 and 2014 there were 4 tournaments... the most before this year. Last year and in 2013 there were 14 race opportunities. Interestingly, the average field size has been shrinking. It was 11.8 in 2013 and has slowly dropped year after year. Obviously 47 races and 5 tournaments means a lot of drivers and a lot of stewards. Thanks to everyone who raced and especially to every steward and tournament organizer. Don Tatum came close and Kevin Keller made a run at WBC from way behind, but in the end I (Doug Schulz) held onto my lead to win the first CFR OP Championship. On the right is this year's top 20 showing their change in ranking from last year. I'll write a longer summary of this season in a later post so I can give it more time. Complete rankings can be seen here. By which I mean, rookie to CFR rankings... Renaud Verlaque showed up at WBC this summer, ran in 3 qualifiers, winning his last qualifier to make the finals table. That was good enough for 27th on the season even after retiring in the WBC finals. Honorable mention to Phillip Walling who scored points in all 3 races he entered this year and ended up ranked 51st. In total 29 different drivers raced this year for the first time since at least 2013. For the best showing from a driver we have not seen in a while... Chris Brandt has been running the event at PrezCon Winter for a while now but last appeared in these rankings in 2013. This year Chris wrote up his results and even participated in other OP events -- 9 races in total -- on his way to being ranked 16th on the year. Honorable mentions for Dan Mallison II and Dave Ingraham who ranked 26th and 41st after spending a year away from these rankings. For the largest jump in ranking from last season (minimum 2+ races the season prior)... Jim Fleckenstein ran 3 races last year, a 3rd, 5th, and DNF -- not making the finals at his only event that year and ranked 46th. This year, raced 8 times, picked up a win, and scored points in both tournaments his entered for a rank of 15th this year. Very Honorable mention to Bruce Lavoie who jumped from 62nd to 31st this year. His three races this year included a win and a third. His 3 races last year included 2 DNFs and a 5th. This was the hardest award to give out. Without every steward, the races would not happen and this post would not exist, but... Michael Polcen did much this season to over come car-gate. 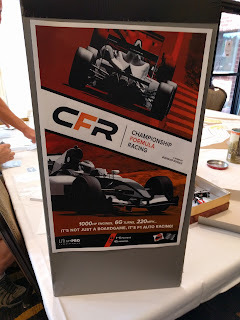 Not only does Michael run the 2nd largest online CFR tournament, he also ran a demo event at his friendly local game store. Very Honorable mentions for Chris Brandt who stewarded 5 races this season at PrezCon Winter, Chris Hancock who stewarded 4 races in two different online tournaments, Chris Long who ran 4 races at the hugely successful WBC, Jim Orlando whose name is not Chris and yet still ran 4 races this year, and Don Tatum who ran his first tournament this year at PrezCon Summer. Great season, thanks, and keep eyes out for early news from the 2018 season of CFR Organized Play. Back in June I talked about the three basic Historical Driver strategies for Championship Formula Racing: Front A, Even, and Back S. This time out, lets compare the three Front Strategies to each other and see how they riff on the theme of spending resources early. My intent with the Front B strategy was to have a car that, while it was going to start out fast, was going to really go all out starting in the middle third of the race. 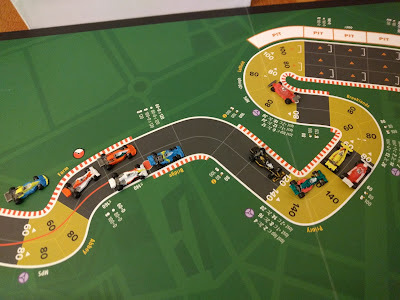 The Front X strategy was an attempt to push even harder in the first third of the race than the Front A and then back off assuming there was little wear left. Front X is clearly all in on this first phase of the race. Also note that Front B gets out of this Phase after the first corner while Front X and Front A stick with it into corner 2. Some interesting comparisons here between each strategies Phase 1 and Phase 2. Front A's net in starred conditions does not change much but the strategy actually gets faster in non-starred situations. Meanwhile, Front X slows down a little in non-starred situations and gets even faster in starred situations. Put another way, Front A is now indiscriminately spending wear in this phase. While Front X will go even faster if its a efficient use but actually will spend less wear if it is not. Front B generally stays similar in non-starred situations and slows down even in starred situations which makes sense given the theory of this strategy. We can see Front A back off here and Front B push to spend more wear. Front X is very interesting in this middle 3rd of the race. If the Front X car is winning, it backs off in non-star situations. If not winning, it will try to spend wear almost as much as Front B. Another thing to note about all 3 strategies is that their time in this 3rd phase can get cut short if they run low on wear. 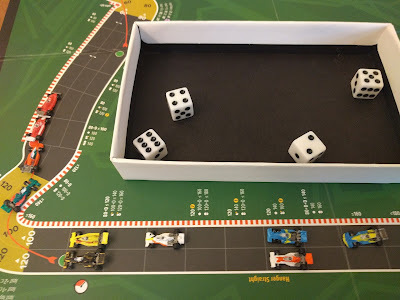 Front A moves down to Phase 4 if the car has wear <= to the total number of laps in this race *2. 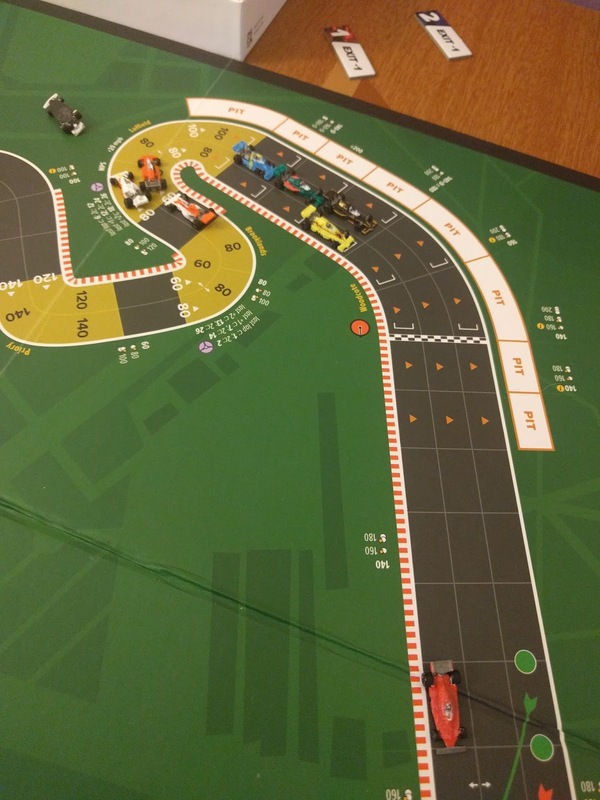 Front B is a little slower to move to Phase 4: < laps *2. Front X will stick to Phase 3 longer: <= laps. As usual, phase 4 has a lot of conditionals and cars will generally spend based on how much wear they have left at this point. A possible difference for Front A is that it will move down to Phase 5 if the car has wear <= to the total number of laps in this race *2. This is the same condition that will force the car to move from phase 3 to 4, so you often see a Front A go from 3 to 4 one turn and then 4 to 5 after the very next corner. Front B has a more standard condition to move to Phase 5 of wear < 2. Front X only moves to Phase 5 if they have no wear left. Some caveats... 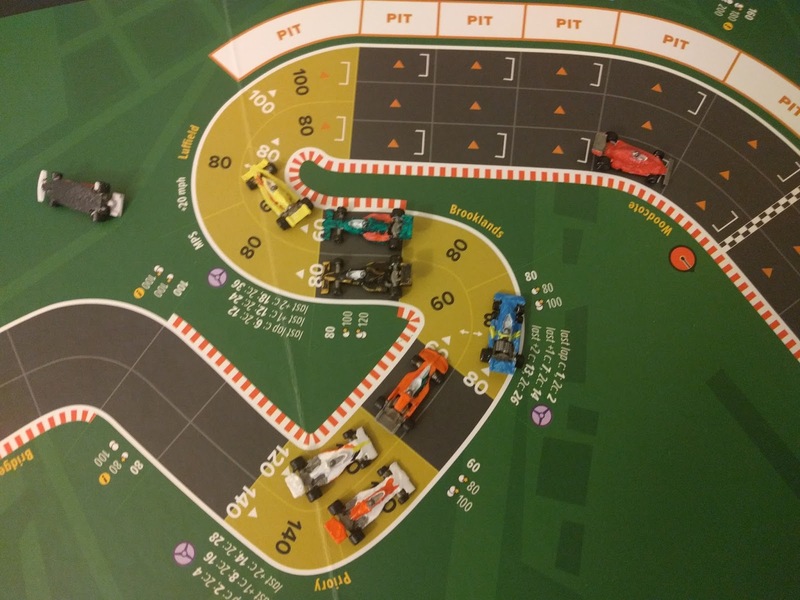 In phase 3 the first number for Front X is when it is winning the race and the 2nd is when it is not. Front A cars often do not spend much time in phase 4 because Front A HDs often run out of wear early and skip out of phase 4 into phase 5 after a corner or 2. However, for all of these strategies the numbers above assume the cars' do not have a lot of wear left in Phase 4. If they have more, they will spend more. Next up I'll discuss the variations on the Even strategy. Remember, links to the above 3 strategies below.